This collection ranges dramatically. With more than 320 poems, it goes across all of history, from the ancients straight through to today. Across countries and languages, across schools of poetry. 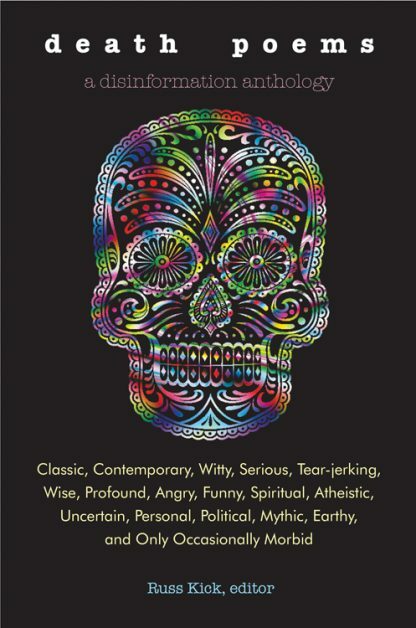 You�ll find a plethora of approaches�witty, humorous, deadly serious, tear-jerking, wise, profound, angry, spiritual, atheistic, uncertain, highly personal, political, mythic, earthy, and only occasionally morbid. Every angle you can think of is covered�the deaths of children, lost loves, funeral rites, close calls, eating meat, serial killers, the death penalty, roadkill, the Underworld, reincarnation, elegies for famous people, death as an equalizer, death as a junk man, death as a child, the death of God, the death of death . . . . The rest of the band includes . . .
Jane Austen, Mary Jo Bang, Willis Barnstone, Charles Baudelaire, William Blake, Charlotte Bront�, Lord Byron, Lucille Clifton, Andrei Codrescu, Wanda Coleman, Billy Collins, Ralph Waldo Emerson, T.S. Eliot, Nick Flynn, Benjamin Franklin, Robert Frost, Kimiko Hahn, Homer, Victor Hugo, Langston Hughes, James Joyce, C.S. Lewis, Amy Lowell, W.S. Merwin, Edna St. Vincent Millay, Pablo Neruda, Thich Nhat Hanh, Friedrich Nietzsche, Wilfred Owen, Rainer Maria Rilke, Christina Rossetti, Rumi, Sappho, Shakespeare, Wallace Stevens, Ruth Stone, Wislawa Szymborska, W.B. Yeats, and a few hundred more.